Arcooda have released a world first Video Pinball machine with VR. The Arcooda Video Pinball machine enables lifelike gameplay in VR on a full size, touchscreen virtual pinball. The machine will be on display this Sunday, October 21 at the Wallsend Back In Time Pop Culture Festival. Playing the virtual pinball machine in VR is as easy as plugging the HDMI and USB cords from the VR headset into the front machine ports. Accepting Oculus Rift, HTC Vibe or any other VR equipment, the machine will enable users to pull the actual machine plunger to launcher ball, use cabinet flipper buttons to control flippers in game play and push the cabinet for real nudge effect. The VR headset will be showcased on Arcooda's Ultra cabinet. This incorporates a steel frame, shaker motors, blower fans, coils and comes Kinect 2.0 ready. This is the deluxe machine with shipping set to begin at the end of the year. 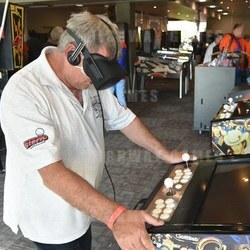 Customers can see and play the machine in VR from 10am to 3.30pm at Nelson Street, Wallsend. More information on the event can be found here.